If you are an author, a researcher, or a student, then you would know how it is difficult to create the reference list, selected bibliography or bibliography. There are different styles—MLA, Chicago, APA, Turabian and so on. The preferences of different publishers, universities or professors vary. So the authors usually find it very difficult to get the style and details right. The fact is complicated by the differences in citing books, proceedings, articles, and so on. Now, you can create your references or bibliographies in a snap, thanks to BibMe a web site that creates the bibliographies for you. 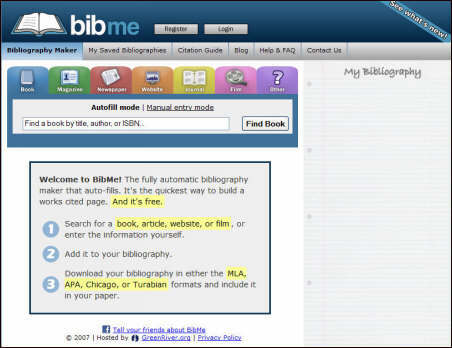 BibMe is your one-stop source for all your bibliography needs! With BibMe, you don’t have to remember all the information for the source you cited. BibMe site allows you to search from a database of millions of entries to find your source and automatically fill in the information. If you have the information about the information source, then you can enter your details. BibMe has a Citation Guide, that offers resources to help you cite your work properly. BibMe uses a host of sources including Amazon.com, FindArticles, Yahoo! News, CiteULike, etc. for the auto-fill feature. You can create bibliographies of books, magazine articles, newspaper articles, journal articles, web sites, movies, etc. The beauty and usefulness of the site is that once you have keyed in all the required details, either using the auto-fill option or manually, you can switch from one style from another just by selecting the style. You can save the bibliographies to your account or you can download it as an .rtf file. Creating an account is easy and this service is free. Aalst, Wil Van Der, Laura Maruster, and Ton Weijters. “Workflow Mining: Discovering Process Models from Event Logs.” IEEE Transactions on Knowledge and Data Engineering, 16.9(2004): 1128-1142. Berger, Carol, Elizabeth Creamer, and Peggy Meszaros. Reconfiguring the Firewall: Recruiting Women to Information Technology across Cultures and Continents. Natick: Ak Peters, Ltd., 2007. Leon, Alexis. Software Configuration Management Handbook, Second Edition. Norwood: Artech House Publishers, 2004. Leon, Alexis. “Alexis’s Ark.” Alexis’s Ark. 20 Oct 2007 . Aalst, W., Maruster, L., & Weijters, T. (2004). Workflow Mining: Discovering Process Models from Event Logs. IEEE Transactions on Knowledge and Data Engineering, 16(9), 1128-1142. Berger, C., Creamer, E., & Meszaros, P. (2007). Reconfiguring the Firewall: Recruiting Women to Information Technology across Cultures and Continents. Natick: Ak Peters, Ltd..
Leon, A. (2004). Software Configuration Management Handbook, Second Edition. Norwood: Artech House Publishers. Aalst, Wil Van Der, Laura Maruster, and Ton Weijters. “Workflow Mining: Discovering Process Models from Event Logs.” IEEE Transactions on Knowledge and Data Engineering 16 (2004): 1128-1142. Leon, Alexis. “Alexis’s Ark.” Alexis’s Ark. http://www.alexisleon.com/ (accessed October 20, 2007). BibMe was initially developed as part of a Software Development project course in the Information Systems department of Carnegie Mellon University. And the people behind this wonderful website are Alvin Fong, Kevin Liebler, Korina Loumidi, Saurabh Mundra, Nitasha Singh and Ben Tucker. Hats off to you!!! Thank you very much for providing this wonderful service and that too for free. I wish you success and fame. Thanks for the nice the review! If you have any questions or ideas don’t hesitate to get in touch. We’re actively working on improvements. Exceptional site. Very useful and a very nice review. Ben: I will. Are you planning to bring out a standalone version–a software product. I think that should be very useful as one doesn’t have to be online when working on the corrections and the like.